In June 2016, the northern California city of East Palo Alto (E.P.A.) faced a desperate situation, one it shares with an estimated half of all urban areas worldwide. It needed more water. Fast. Long an economic laggard, bypassed during the dotcom boom of 2000, East Palo Alto’s ethnically diverse population of 30,000 had subsequently gained new life with the arrival of Facebook and other Silicon Valley powerhouses, with new schools, affordable housing, and high profile projects in the works. Then, suddenly, growth ground to a halt. In July 2016 the city had to prohibit “new or expanded water connections” as E.P.A. simply couldn’t guarantee access to supplies. Worse, formerly reliable sources had begun, literally, to dry up. Old dams were leaking, in some cases failing. Even if repaired, climate change meant reduced snowpack and tapering runoff left even less surface supply that could be stored. The state had just passed a strict groundwater law that put a restrictive ceiling on well pumping, environmentalists had campaigned aggressively against desalination plants, and energy expenses were making treatment prohibitively costly. Increasingly dry, and financially strapped as a result, East Palo Alto needed a radical solution and in May 2017, it signed a ground-breaking deal to buy the water it needed from the neighbouring city of Mountain View. A second deal with Palo Alto signed earlier this year has also transferred urban water rights to E.P.A, and for cities sharing East Palo Alto’s predicament, trading with other municipalities may offer a new way to relieve a damaging water shortage. Trading water as a concept is hardly new. Water markets have emerged over time and around the world to shape the local economies of traditional cultures. Customary exchanges anchored Arabian aflaj, Persian qanat, Balinese sobek, or Moroccan khettara. Arid regions from Australia to Chile to Arizona allowed farmers to engage in handshake transactions among upstream/downstream irrigators. And the unserved millions in the slums around megacities have spontaneously brought trucks and tankers to trade water in the shadows of back alleys. But trading between cities is certainly novel and even with the traditional reference points mentioned above, water markets have long struggled to enjoy formal, institutional legitimacy. One indication that the novel approach remains on the periphery: water market trading lacks its own IWA specialist group. Global brokers flourish on global grain and livestock commerce, blind to the reservoirs of virtual water it took to produce each commodity. Everyone knows the market price of bread bought and sold each day, but none the value of water embedded within each loaf. Among resources, water alone is not bought and sold outside customary, rural or grey markets. Why that should be so is a vexing question that dates back centuries. In the 18th century, Adam Smith’s economic masterpiece An Inquiry into the Nature and Causes of the Wealth of Nations celebrated how our unique human propensity to “truck, barter and exchange” is universal–with one notable exception. Smith was baffled at what became known as “the paradox of water”: why useless diamonds were so priceless, while life-giving water itself had “no value in exchange.” It took 19th century economists to demonstrate how clean water’s relative availability defused urgency to trade for it. People can and do pay for the convenience of service provision (by natural monopolies), but the ubiquitous nature of water itself was in economic terms “marginally” worthless, negating large gains from establishing a formal market. By the 21st century, however, the ‘margins’ had shifted. Today water abundance is the exception, urban scarcity the rule. Cities have not only begun buying up any ‘surplus’ water saved by farmers, some utilities are even testing water savings credit markets to source water from within their service area. In Asia, and the Middle East, thirsty countries are exploring transnational water transactions to fuel urban growth. Regulatory agencies scale up water quality trading, and markets for stormwater runoff. Amidst this backdrop, as East Palo Alto looked around in search of options, its neighbours and regional governance agencies alike saw an opportunity to unlock an unprecedented kind of market: water trading among co-riparian cities. East Palo Alto and two dozen other municipalities share the Tuolumne River. 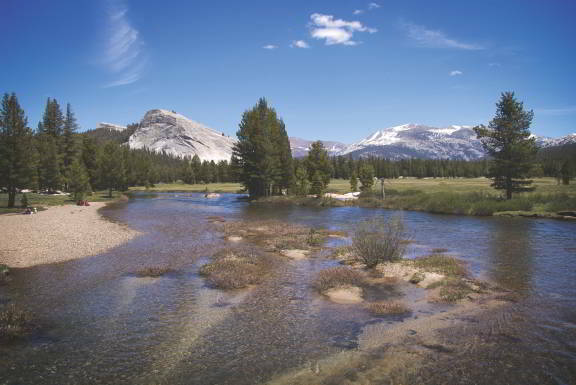 Its tributaries, which rise in the distant Sierra Nevada, were controversially dammed in Yosemite National Park, and diverted to distant San Francisco and San Jose. Based on historic usage, East Palo Alto (late to incorporate, slow to develop) was allocated the runt’s share of 2 million gallons per day. Despite relatively low use by low-income communities– residential use of 52 gpcd versus 218 in nearby cities–demand still exceeded supply in many years. Then the water crisis froze new activity. Initially, East Palo Alto just asked the regional entities for more. While sympathetic, neither the San Francisco Public Utilities Commission nor the Bay Area Water Supply and Conservation Agency could augment supply. For starters, there was no new water to be had. Even if there were, breaking precedent would lead most cities in the region to demand that the floodgates be opened too. Forced into a box, East Palo Alto turned to its two closest neighbours, Mountain View and Palo Alto. Both had been allocated–and forced to pay for– more water from the wholesale agency and regulator than they were currently selling, so it made sense for each to bring what they could save “to market.” Mountain View sold East Palo Alto the permanent rights to 1 million gallons per day for US$5 million, while Palo Alto bundled a half million gallons per day into a larger transaction involving construction and development. The amount of money involved in the transactions, though far from negligible, cost much less than alternative sources. Secure water access ensured projects could proceed, allowing the city bond holders, and developers a rapid and healthy return on investment. And while three parties to this local water market did not hold a candle to the thousands of hourly trading activities on, say, the New York Stock Exchange, it was in the realm of urban water, ground-breaking. Looking back, Lohan and Hosfeldt are entirely correct. Amidst countless cases of cities grabbing water, one finds none of them surrendering it back or passing it on to neighbours. By looking ahead, however, one finds the East Palo Alto precedent has broad support among thought leaders, and an extensive history of rigorous modelling efforts. The University of California has quantified the benefits of a water market in Los Angeles County. Gains from formalised trade in a well-designed exchange would benefit parties in currently isolated systems where some pay US$200 and others pay US$2,000 for the same quantity and quality of water. While advocates of urban water trading highlight financial incentives, the stakes transcend monetary gains. Franklin M. Fisher, a renowned economist at Massachusetts Institute of Technology, has argued that the escalating global phenomenon of water disputes arises when the resource is “considered to be a zero-sum game: one party’s gain (in water) is another’s loss. Such a view of water allocation can lead only to conflict.” By trading water as an economic good, however, cities and regions–especially those in water scarce regions like the Middle East–can optimise water access, defusing conflicts before they arise. One thorny issue in any market, of course, is the starting point: who receives rights to how much water for use, saving, and trading. An initial allocation based purely on past usage may favour a few entrenched political interests at the expense of future generations. Conversely, an initial allocation based entirely on social equity (with each user receiving the same amount) delivers a windfall to many who are unable to invest in conservation. Open auctions may lead to volatility and speculation. Spatial or random allocations are clunky and thin. Sorting out these important details of competing interests is no small task, involving compromise, and leads directly to the issue of water market design. It often comes as a surprise to many that markets do not emerge by spontaneous generation. Rather, markets evolve through natural selection, seeking to adapt, build symbiotic relationships, and fit the ecological niches for which humans (the only species that trades) designed them. A market can be as small and simple as two neighbouring irrigators or utilities, or as potentially vast and complex as millions of metered accounts trading usage credits within the contours of a river basin. The larger the scale, the more complicated the market (and the more moving parts with potential to fail). In both cases, the stakeholders clearly define their market’s goals, resource scope, eligible participants, unit metrics to trade, accountability system, and governance of transaction rules. In short, water markets are neither good nor bad; they are, for better or worse, amoral creations: reflections of the needs and interests of the diverse people who design, build and operate them. Powerful, and potentially volatile, water markets deserve to be approached with caution. They appear to perform best within a strong regulatory framework, and are never a panacea. Yet after decades of countless symposia and conferences filled with speakers urging the same mantras–to “reveal water’s true value,” or “integrate water resources management,” or “encourage water efficiency on both sides of the meter,” or “build resilience through smart flexible regulation,” or “engage with water users outside our immediate sector”–markets offer water professionals at every level a set of versatile new tools of the trade. Next articleHold back the waters – for cash?